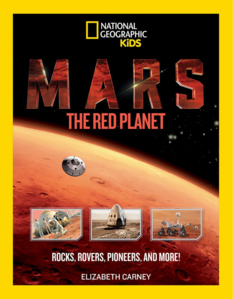 ­­­­Welcome to my eighth annual kids' space book recommendation post! This post is for you even if you don't have your own kids. Most school library space bookshelves are woefully out of date, and you can help your community by buying them a few good books to inspire an interest in exploring the stars and planets. To that end, I've created a new page in which I've gone back through previous posts to make a list of all of the books that I still recommend for gifts or libraries. I recommend every book listed here or there. As usual, I split the books by age group, but depending on the kid you may find books appropriate for them in different age groups. I have relatively few books for 4-8 year olds this year; I'll try to do better next year. If you don't find enough on this list for your preferred age, check my collected list. 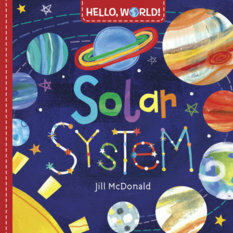 Solar System is a good baby board book with colorful paintings of planets. It doesn't have annoying singsong rhyme, so can be read over and over without pain. It invites the toddler to point at one planet, trace Saturn's rings with a finger, and finishes with a panorama of all the planets, asking baby "Where would you like to go first?" Pluto fans, rejoice: Pluto is included, with no aspersions cast on its character. It's a relief to have one baby space book to recommend that does not just list all the planets. 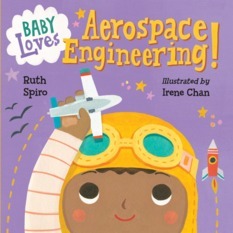 This adorable baby board book talks about how Bird can fly, then asks if airplanes fly like birds? (No!) But at least Bird can commiserate with the airplane that neither can go to space. In the end, the bird gets to take a rocket into space. Have fun, bird! Looking for kid-friendly science experiments that you can do with your children? 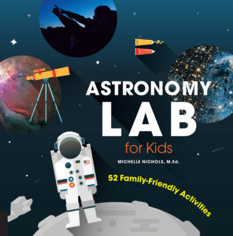 Astronomy Lab for Kids includes 52 of them, most of which use materials you can find around the house. Many of them stand alone but the book actually builds from unit to unit, beginning with activities training kids in skills of observation, focusing on the rhythms of the sun, moving on to light and how lenses work, and then getting in to the solar system, stars, and galaxies. One of the early activities involves making a cardboard box pinhole projector to view the Sun safely, and many of the later experiments reuse it. I appreciate the clearly stated durations of each experiment. Each experiment has an explanation of the science behind the fun and suggestions for enrichment activities. When experiments involve more than one child -- and many do -- the text splits the tasks between the children, giving each a job title, like "Observer" and "Modeler". One fun holiday gift idea would be to put this book in a box with materials collected for the first 20 or so experiments, with a special "lab notebook". 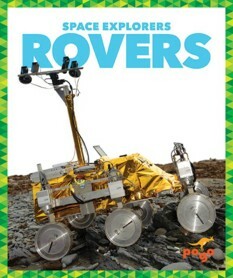 These two books introduce young kids to the two main kinds of autonomous robots we use to explore space: orbiters and rovers. With short text and large images on each page, they're a simple introduction to what these kinds of spacecraft have in common (how they're powered, how they acquire data, how they communicate with Earth), and feature a brief activity at the end of the book. The vocabulary in the text will be challenging for younger readers, so these may be better as read-to-me books than read-alone books. There are three other titles in the same series that I don't recommend. Okay, it's not a space book, but I love the third installment in Beaty's book series that began with Iggy Peck, Architect and Rosie Revere, Engineer. Ada Marie Twist (named for two great science women) is a natural scientist -- which means she annoys her family and friends with constant questions and smelly experiments. 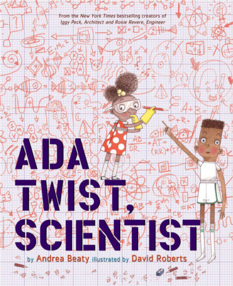 Her parents get frustrated and banish her to a thinking chair -- but her family learns to appreciate their daughter's curiosity and Ada learns to channel her curiosity more constructively. Beaty's books are in Seussian tetrametric verse, which can be singsongy; but the verse is excellently executed and fun to read aloud, featuring some challenging words in context that will extend the vocabularies of young readers. A delightful book of poetry inspired by space, planets, astronauts, and aliens, with contributions from nearly 30 British poets. There are long poems, short poems, metered and not, with tone ranging from awestruck to silly, dreamy to defiant. Scribbly illustrations reminiscent of Quentin Blake accompany the poems. I’ve marked several that I can’t wait to read to classrooms, including “Art 101 for Aliens” (instructions on crop circles), “Compared to What?” (inviting kids to think about how “big” is relative), “Up Above” (imagining the sky-inspired mythologies of different Earth animals), and “Uranus, Roll Up, Roll Up,” a poem all about how Uranus is happily, confidently, different from the other planets. 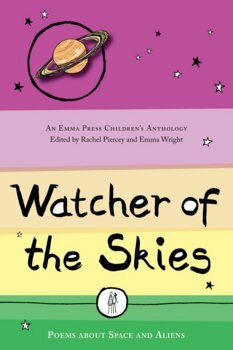 At the end of the book is a list of prompts for kids to write space-inspired poetry, and short biographies of all of the poets. Give this book to your kids’ English teachers! Librarians, this is the book you've been waiting for to update your outdated solar system shelf with the latest word on Pluto. Mission to Pluto is comprehensive, covering Pluto's discovery, early observation, and exploration and early science results from New Horizons. It's all wrapped in an exciting narrative about the encounter, featuring the voices of several scientists and engineers from the mission, including Alan Stern, Alice Bowman, and Fran Bagenal. The book does a good job of confining the tiresome planethood debate to a single page, and spending the rest of its 72 pages on the exciting adventure and fantastic science of the New Horizons mission to Pluto...and beyond. 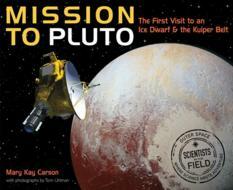 Just like the Pluto book above, this is a good choice for libraries looking to update their solar system bookshelves. 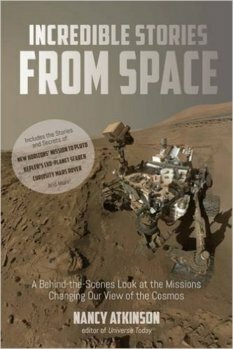 It is a fun and comprehensive introduction to Mars and Mars exploration, featuring lots of topics of current interest (astrobiology, the search for present and past water) as well as up-to-date summaries of the latest Mars explorers. There's a two-page spread on Curiosity, followed by a pages on planetary protection, several on what we have to do to prepare for human exploration, and a final spread on terraforming. Although it has flaws, I cautiously recommend this book. 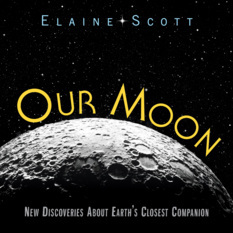 It primarily focuses on the Apollo missions, with some dramatic retelling of the story, but carries Apollo into the present with well-explained and -illustrated text on the samples, how they're curated, and what we are learning from continued analysis of them. Photos are well selected and credited. It also includes some basics on lunar geology, including how impact craters form. However, some of the explanations of lunar science veer off into factual errors, particularly in the last chapter describing relatively current lunar exploration. And it spends lengthy text on Anaxagoras, Aristotle and Galileo, then skips directly to Apollo without once mentioning the Lunar Orbiters or other robotic missions that enabled Apollo, an omission I find really strange given their importance in establishing the scientific success of the Apollo missions discussed later in the text. I think the book's pluses outweigh its minuses and it fills a gap on library bookshelves, but I wish it had had a better technical editor. 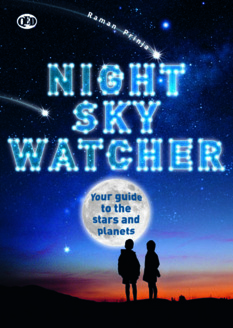 Night Sky Watcher is an excellent introduction to naked-eye astronomy for kids age 9-12. Each two-page spread covers a different topic (e.g. types of stars, individual constellations, why different constellations are visible at different times of year, the phases of Venus, etc. ), with well-chosen illustrations and photos and practical advice about how to spot things in the sky. The language is highly accessible: clear, concise, without unnecessary jargon, while packing in plenty of information. Unlike any other fact-oriented book I reviewed this year, I found no factual errors within it, though I didn't read every word. The book is paperback but comes in a zippered slipcase that makes it easy to take camping. 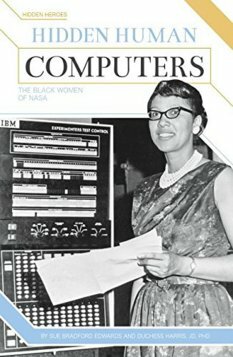 You may have heard of the upcoming movie Hidden Figures, based on Margot Lee Shetterly’s biography of five African-American women who worked as NASA “computers”. Sue Bradford Edwards and Duchess Harris’ book Hidden Human Computers tells the story of those and many other computers who worked for NACA and NASA from the 1940s to the 1960s, and traces their influence to the present. (Harris is herself the granddaughter of one of the computers, Miriam Daniel Mann.) The book is rich with quotes and stories from the women and their relatives. Edwards and Harris detail the diverse types of research that the computers’ work facilitated, and draw direct parallels between the kinds of work (and wages) available to white men, to white women, and to black women of equal skill. Sidebars on nearly every page provide historical and cultural context and technical explanation that enrich the text but can also be skipped if the reader becomes engrossed. I was captivated by the stories of all these women who contributed so much to the development of space technology and human spaceflight, shifting to programming jobs as computers became more capable. They also contributed to opening up wider opportunities for other women. All in all, an inspiring book that belongs in every school library for kids 12 and older. Note: This book will be published on December 15. If you've been having trouble keeping up with all the latest results from this golden age of planetary exploration, Incredible Stories from Space provides a crash course on the exciting stories of nine currently active robotic space missions, as related to author Nancy Atkinson by the women and men who work on them. Atkinson weaves together the challenges of preparation, adventures of exploration, and scientifically awesome results in the way she has done at Universe Today for more than a decade. The book is up-to-the-minute with its events and facts. The first chapter covers the successful New Horizons encounter with Pluto; a chapter on Dawn mentions the recent decision to spend its extended mission at Ceres; and the chapter on Cassini has Linda Spilker reflecting on the "lasts" that the Saturn orbiter is doing, now that its end is almost here. The book has small but crisply printed color photos on nearly every page, which will help to make it an engaging read for older kids. Note: This book will be published on December 20. 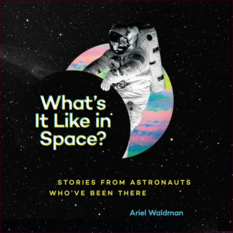 Ariel Waldman has assembled 60 very brief anecdotes about what it's like to live in space, as told by astronauts. Some of the stories are mundane (how exercising works, or why shrimp cocktail is a favorite food). Some describe the challenges of living in space, and their solutions, like the "push and burp". Many stories are uncomfortable, and many of those involve bodily fluids. (I had not heard of the Garn scale of space sickness before.) And some stories are sublime, like Rusty Schweickart's story of "being human" in space. This book is mostly suitable for 9-12-year-olds, too, as long as you're willing to explain to them what a condom is (they were once used as urine collection devices), and aren't concerned about your kids loudly resharing some gross story about space vomit. As a bonus for Hitchhiker's Guide fans, towels feature in many of the anecdotes. Most people think you need fancy equipment and special locations to appreciate the night sky. 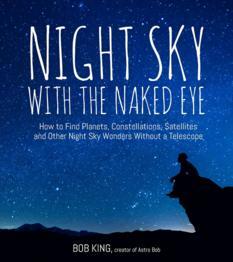 Bob King's Night Sky with the Naked Eye guides new skywatchers to the natural and artificial wonders of the sky visible with their own eyes from their own neighborhoods, making astronomy accessible to everyone. Each chapter opens with a list of activities that the reader can expect to be able to do after reading it. I especially appreciate the opening chapter on satellites, which discusses how to spot them and thoroughly explains the reasons why they move across the sky and change in appearance as they do. The book also contains lots of practical advice on photographing sky phenomena. The text is very small, but it makes more room for lots of excellent photos and illustrations, many of them created by the author; all are credited in the captions. Human space travel has always been as much about imagining possibilities as it has been about actually going to space, and is likely to remain so for some time: even when we start launching humans to Mars, the vast majority of humans will still only be imagining spaceflight. Miller's book takes the reader on a tour of the history of spaceflight, beginning with the "dreamers" who imagined gods among the stars and invented the rocket, inventing science-fiction space travel at the same time. 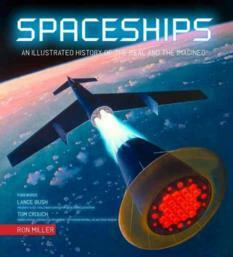 It proceeds in great detail through the rest of spaceflight history, seamlessly blending discussion of fictional space vehicles and the developing science and engineering of space flight, finally incorporating actual technology development after World War II. It's easy to see how developments in technology feed back in to popular culture and science fiction, and vice versa. Unfortunately, and very strangely, the book ends with a "future flight" chapter that appears to have been written somewhere around 2009, and is already woefully out of date (the canceled Constellation program features heavily). A few images more recent events have been pasted in, but the book would be better without that chapter. The presence of the out-of-date "future" material suggests that this book is made of material reprinted from earlier books; I'm guessing some of its contents go back to this 1993 book by Miller. An interesting book that presents a selection of historically great journeys, each richly illustrated with maps and photos. Each story is briefly told, covering about 4 pages of dense text. Three space stories are included in the collection (Gagarin's first flight, Apollo 11, and the Voyager missions) as well as several others of interest to aerospace and ocean exploration enthusiasts (Earhart's transatlantic flight, Solar Impulse, Jacques Cousteau's voyages). The book includes a predictable selection of male Europeans of the colonial era. But there are also many non-European and/or female travelers, many of whom I knew little or nothing about, such as Zheng He, Gertrude Bell, Alexandra David-Néel, and Ibn Battuta. 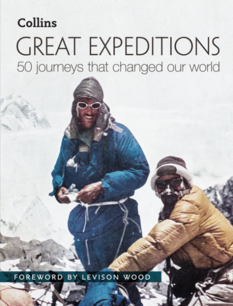 The editors also made interesting choices of modern voyagers, including stories about the three indigenous Australian girls who escaped captivity in their 1600-kilometer walk along the rabbit-proof fence; the anti-whaling ocean expeditions of Greenpeace; and the trans-Canada run of amputee Terry Fox. The variety of journeys represented invites readers to reflect on what drives humans to travel so far, and what qualities make them successful. This would be a great resource for a kid looking for ideas and basic information on historical explorers as a springboard for further reading, or for a child who wants to find out about heroic efforts by some relatively unsung heroes. Thanks for the list, does anyone happen to have a list of German books? Thanks for making my book search for my little granddaughters easy. They will enjoy them at Christmas time.